Hi Anna, I'm sorry your hair was pulled. Does it happen often? Ouch! I most certainly do have bad hair days (almost every day!) so I can relate. I like all the Bailey School Kids characters, although my mom says I was a bit like Eddie. I feel like sometimes I'm like Howie and sometimes I'm like Liza and sometimes I'm like Melody too! Have you tried the Guess Who game? It's to see how well you know all the Bailey School Kids characters. Good luck! Greg, you are an awesome brother. Please tell your little sister I said hello! Vicky, I'm so glad you like my books. 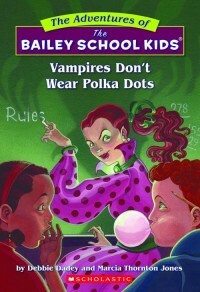 Sara, did you know Vampires Don't Wear Polka Dots was my first book?